Looking for a Nashville area wedding photo booth rental, corporate event photo booth services, a photo booth for a birthday party or graduation party, or any kind of special gathering...our professional photo booth will be the hit of any event in the Nashville and Middle TN area. Providing Photo Booth rental for Nashville, Spring Hill, TN, Franklin, TN, Brentwood, TN, Murfreesboro, TN and all of Middle TN...contact us today to get the best photo booth for your event! The Star, A Nashville Exclusive! We have a variety of photo booth backgrounds to choose from! A Nashville Exclusive, The Star does it all! Sleek and eye-catching, The Star is perfect for your wedding, fun event, party and more. It delivers beautiful and fun photos, GIFs, Boomerangs, Social Media uploads, Text, Email, Prints, plus so much more. It's also the booth to use for your corporate event because it can be wrapped and branded for your company event! The Show is available for 24 hour rental, longer events, and every party where you want a fun, colorful, experience without sacrificing quality and features. Your Family-owned and operated photo booth rental in the Nashville area. Contact us today! Nashville Photo Booth Rental...CLICK HERE to get a quote for your Photo Booth Event. Whether you're needing a wedding photo booth, photo booth rental for your corporate event, church event or community event, or if you want to build awesome memories with a photo booth for your birthday part, mitzvah or graduation, please contact us! We have a vintage photo booth feel with all of the best features including email, video messaging, Facebook, and more plus every package includes our photo booth props! Why rent a photo booth from Perfect Party Pix Photo Booth? Proprietary software and the highest quality hardware give you great photos that are beautiful! 2. Props, props and more props! Our props package comes with every package we offer and gives your guests creative fun! 3. Customization & Custom Branding! Your wedding photo booth strips can be customized with your name, theme and colors. Corporate events can include branding with your corporate logo. In fact we can customize every kind of event with logos, names, colors, etc. Your guests will get a total touch-screen photo booth experience and while they are getting their photos printed, they can also email their photos to whomever they would live, have them uploaded to Facebook and so much more! Because of our proprietary software, we can offer these features! Photos are awesome but what if your guests could also record a video message for you right there in the photo booth? You CAN! Our photo booths offer video messaging so your guests can create a special moment for them and for you! 6. You get the pictures and videos! That's right! We offer the option that gives you all the photo booth photos and video messages in a digital format so you can use them, post them and save them for years to come! We offer the best options in photo booth rental because we have years of experience! 7. Unlimited Photo Booth use! When you book your photo booth event with us, you get unlimited use for the time you booked. That means you and your guests can have tons of fun and an amazing experience! Because our proprietary software works hand in hand with our total touch screen experience, our attendant doesn't get in the way, but rather enhances your photo booth experience. Every package we offer includes a professional attendant! You can be sure that your wedding, corporate event, birthday party, graduation, church event or community event will have the highest quality photo booth service! From 2 hours to how ever many hours you would like, we can create a photo booth package to meet your needs and give you the best value for your money. The principles and values that we employ daily in our lives are the same ones that guide our business. We strive to provide the best photo booth service and working in an honest, reliable and hard working manner. 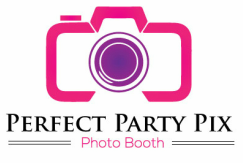 Make your event extra special by renting a Photo Booth from Perfect Party Pix! Professional photo booth services that include an attendant for every event. Also included in every event is use of our photo booth props package! Contact us today for a photo booth package that is perfect for your event!